Buick gets Wild. The Buick Wildcat was shared the the structure of the with its B-body stable mate, the LeSabre, but was marketed as a sports model. For 1965 the Wildcat was redesigned along with all GM B-bodies. The new Wildcat featured more rounded bodylines and a Coke-bottle profiles with semi-fastback rooflines on two-door hardtop coupes. Wheelbase remained the same as the 1964 model at 123 inches, but the new perimeter replaced the “X” frame used on the 1961-1964 models. The Wildacat was available in base and Grand Sport, “GS”, trim levels. 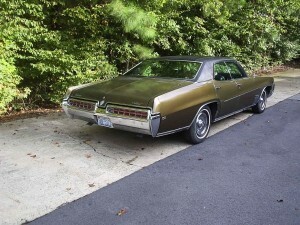 To differentiate the LeSabre and the Wildcat, the Wildcat used less chrome trim than the LeSabre. Interiors were also new for 1965 with a revised instrument panel featuring two round dials for speedometer and new heating/air conditioning controls. For 1966 only, the Wildcat was available with Wildcat “Gran Sport Performance Group” package. Two engine choices were available a 425 cubic inch 340 horsepower V8 with a single carburetor or a dual carburetor version with 360 horsepower. Other features of the Wildcat included dual exhaust, heavy-duty suspension, posi-traction and updated rear quarter-panel “GS” badging in the new, initials-only format employed on all post-1965 Gran Sports. 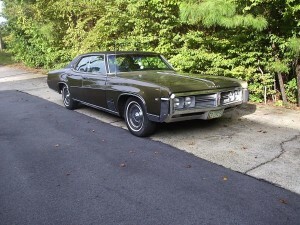 Buick made minor changes the Wildcat in 1967. A new 430 cubic inch V8 engine with a four-barrel carburetor and 360 horsepower was added to the option list. Other changes included revisions to the grille, paint colors and interior colors. The Wildcat would carry through the end of its model run with minimal trim and color changes. Why mess with success. The final model year of the Wildcat was ofered in only Custom trim. 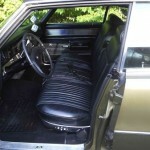 However, Buick replaced the optional 430 V8 engine with a 455 cubic inch engine that was bored out version of the 430. The “new” 455 was rated for 370 horsepower. 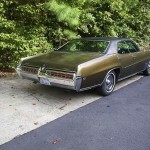 For 1971, General Motors introduced all new B-bodies. With the changeover, Buick replaced the Wildcat with the Centurion. The Centurion would serve as Buick’s full-size sports model until 1973. 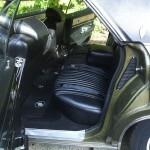 For see other B-body stories, see our post on the 1961-1964 Oldsmobile 88 or the 1965-1970 Chevrolet Impala. For information on other Buicks, see our post on the 1963-1965 Buck Riviera. To find or sell you own classic car see the Classics for Sale listings. 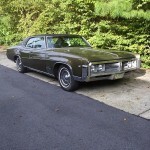 This entry was posted in Wildcat and tagged B Body, Bonneville, Caprice, Catalina, Delta, Eighty Eight, Impala, Lesabre. Bookmark the permalink.